Turn back the hands of time and place yourself in the glory days of a 1900's Georgian Revival Farm Mansion. Surrounded by period antiques and reproductions, allow yourself to be lost in the romance and charm of an era almost forgotten. Our premier suite is paneled with dark oak wood and features a beamed ceiling. Intricately carved woodwork surrounds the two brick fireplaces and the room has unique leaded glass windows throughout. The spacious bedroom area is home to a canopied King bed, grand fireplace, and large leather sofa, as well as a Jacuzzi tub, and complemented with a full bath. 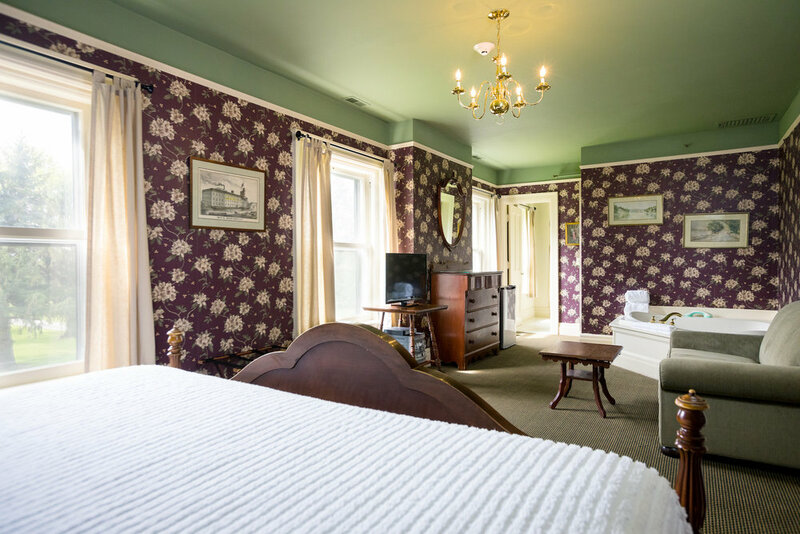 The front room of the suite includes an original antique leaded glass bookcase, fireplace, full sized pullout sofa bed, and a second television. This section of the suite can be closed off entirely via a beautiful oak pocket door. White Springs Manor Guesthouse Lewis Suite joins with the Music Room. A cozy and romantic getaway, the Music Room has a cream annex surround fireplace with carved mantel above directly facing the Queen bed. A spiral staircase leads down to a Jacuzzi tub and bathroom with a walk-in shower. One of our most popular accommodations at White Springs Manor this room has large wood windows with a spectacular view of Seneca valley and the vineyard. The second largest room at the manor features a Grand marble fireplace with intricately carved oak surround. If you love antique books, this room has a beautiful original leaded glass bookcase full of timeless classics. This room also features a king size bed, Jacuzzi with wood surround and bathroom with a standing shower. Stay in one of the largest rooms in the Manor. This room features original leaded glass windows throughout, a massive fireplace with black marble surround, and a carved oak armoire. Ornate sconce light fixtures and a huge original gold leafed mirror grace the Living Room, along with a King canopy bed and Jacuzzi tub. The uniquely designed spiral staircase leads to a private bathroom with a stall shower. 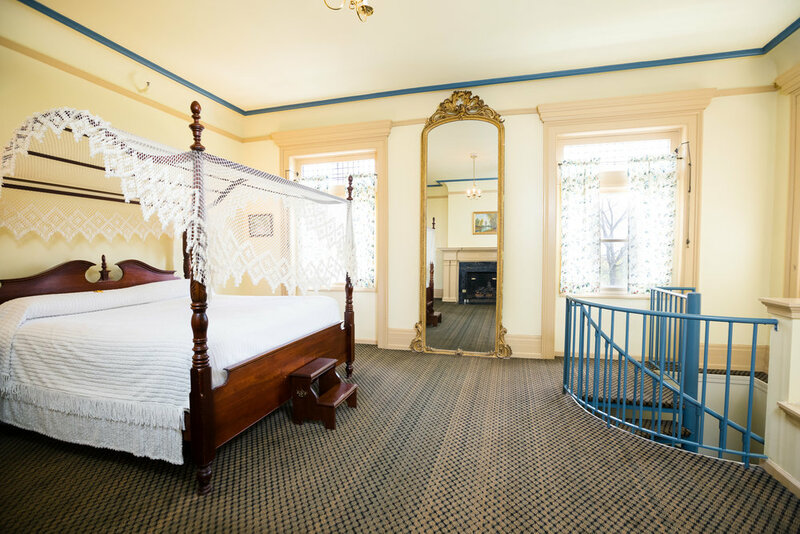 This Georgian revivalist-style room has an elevated Jacuzzi tub, as well as a Queen bed and lovely antiques throughout, including a full-length dressing mirror. The bathroom features a large walk-in shower. Relax in the sitting area, complete with sofa bed, and enjoy the lovely view of the pond nestled on the Manor property with the vineyard visible in the distance. Cozy up by the fireplace with Delft tile surround and carved mantel. Enjoy a soak in the Jacuzzi tub before snuggling down into a King bed. This room also features a private bath with walk-in shower. 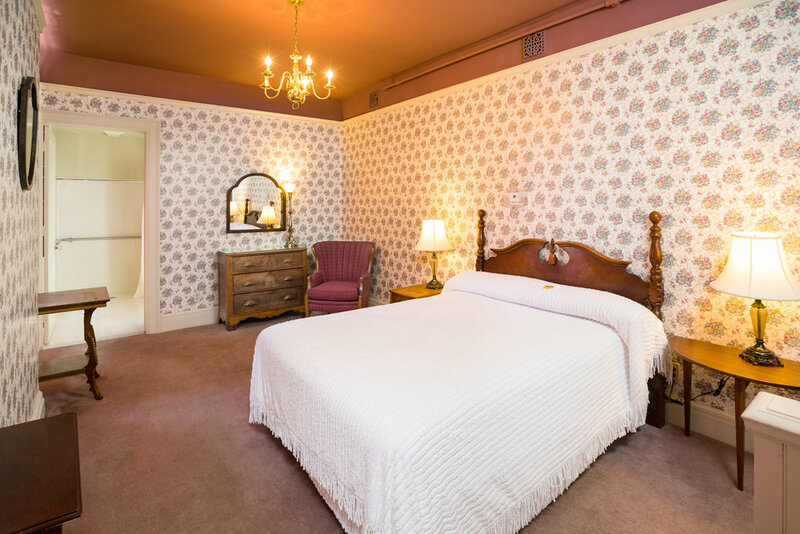 Small and lovely, the West Room is well appointed with antiques throughout. This room has a Queen bed and uniquely designed private bathroom with a walk-in shower. True to its namesake, this room features a lovely view of the pond and gazebo on the White Springs property. 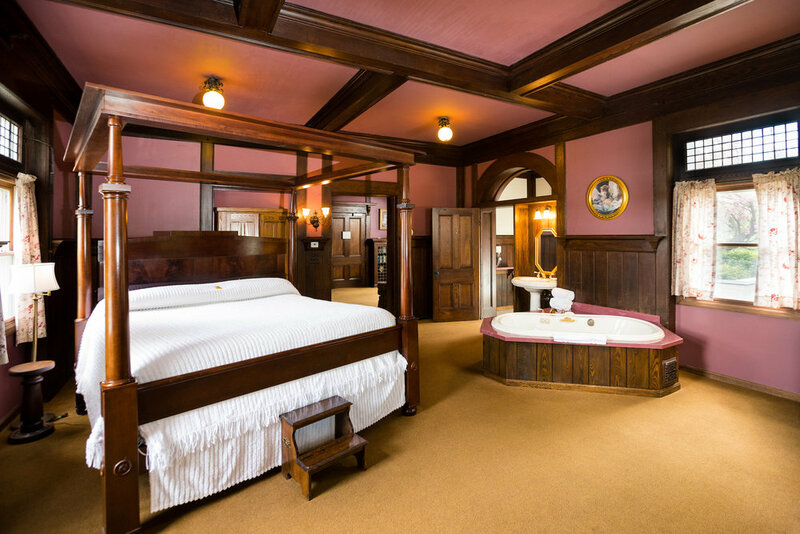 This room is located on the second floor of the Mansion and has a king bed, Jacuzzi, Brick fireplace and bathroom with a standing shower. This second floor room has a spectacular view of Seneca Valley. The mahogany King bed faces a pink marble surround fireplace with a uniquely carved mantel. 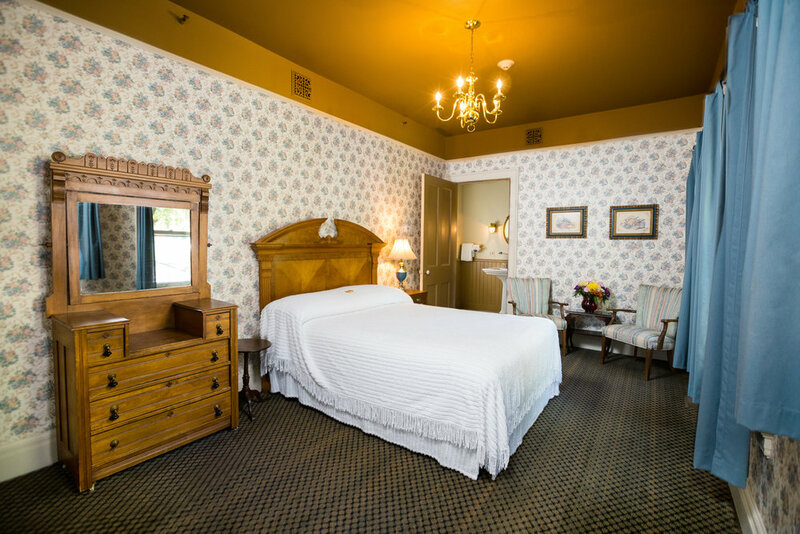 The Lee Room features a Jacuzzi, love seat and bathroom with a walk-in shower - perfect for a truly relaxing stay. White Springs Manor Guesthouse Lee Room joins with the Sheldon Room. Doric columns flank the fireplace, and give the Sheldon Room a sense of old-world elegance. The canopied King bed and a collection of antique books add to the charm. The room features a Jacuzzi tub in addition to a full bathroom. White Springs Manor Guesthouse Sheldon Room joins with the Lee Room. One of our smaller rooms at the Manor the young room is located on the second floor of the mansion and has well-appointed antiques throughout. Queen bed and bathroom with a standing shower. This is a cozy, bright room with large wood-framed windows, view of the side yard of the Manor, floral wallpaper and graceful antiques. 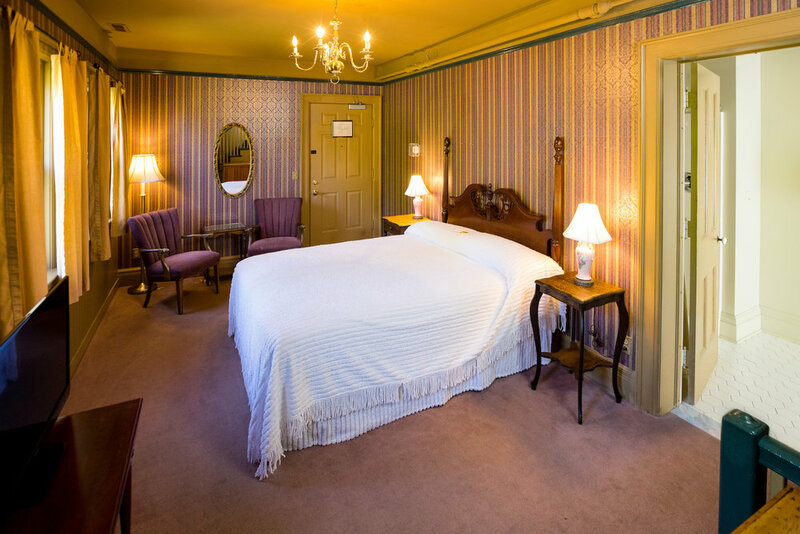 The Mandigo Room features a King bed, Jacuzzi and private bath with walk-in shower. This little cottage was the original playhouse of the Lewis children, and now charms all ages with its quaint sitting room and two bedrooms. It’s just 70 yards from the Manor Guesthouse, with its own private gravel driveway and gorgeous views of the vineyard and lake beyond. You’ll be delighted by the Play House’s wood beamed ceiling, pendant lights and the large field stone fireplace. The Play House also includes a Jacuzzi, two Queen bedrooms, glassed-in porch and full bath.